Budge, Sir Ernest Alfred Thompson Wallis. London: Oxford University Press, 1930. 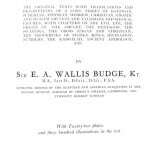 First edition of English Egyptologist and philologist Ernest Alfred Thompson Wallis Budge’s classic work. Octavo, original cloth, gilt titles to the spine, illustrated with twenty-two plates and three hundred illustrations in the text. In near fine condition. A nice example. 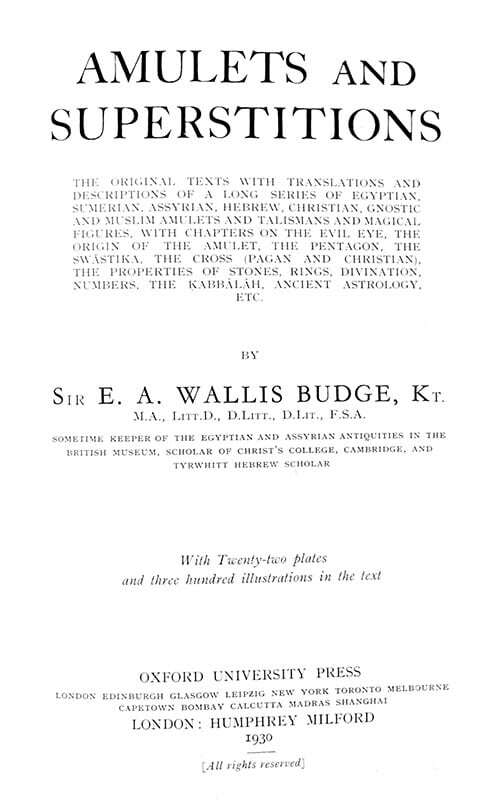 English Egyptologist, Orientalist, and philologist Sir Ernest Alfred Thompson Wallis Budge greatly contributed to the collection of Egyptian and Assyrian antiquities of the British Museum and published numerous works about the ancient Near East. 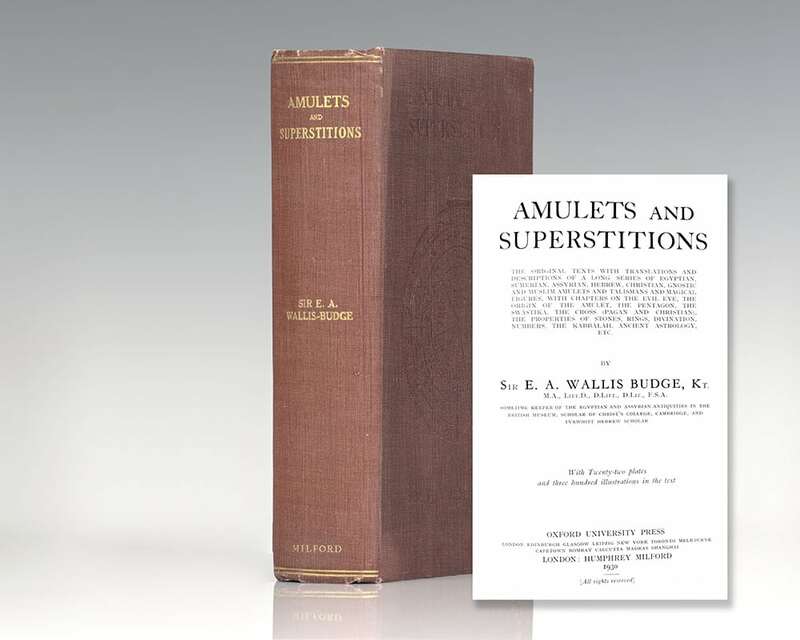 His 1930 publication Amulets and Superstitions contains original texts with translations and illustrations of a long series of Egyptian, Sumerian, Assyrian, Hebrew, Christian, Gnostic, and Muslim talismans and magical figures with chapters on the origin of the amulet, the properties of stones and rings, and ancient astrology. London: Robert Barker, Printer to the Queenes most excellent Majesty, 1602. Early 17th century versions of the English Book of Common Prayer and The Old and New Testaments printed by Robert Barker. Octavo, elaborate gilt tooling to the front and rear panels, raised bands, marbled endpapers, hand tooling to the page edges. Title page of the Booke of Common Prayer printed with elaborate red and black woodcut frames. Title pages of the Old and New Testament printed with elaborate black and white woodcut frames with portraits of the holy saints. In very good condition with some professional restoration to a few pages. An exceptional example. Rare 18th Century Heart-Shaped Christian Broadside. Rare late 18th century liturgical broadside. Printed broadside mounted on a decorated heart-shaped hardwood frame with a hand-painted botanical border containing Protestant liturgical chants, daily prayers, and hymns. Text in Latin. In very good condition. Scarce and desirable. The Morals of Confucius, A Chinese Philosopher. London: Randall Taylor, 1691 [i.e., 1780]. First edition in English of The Morals of Confucius, in full: The Moral of Confucius, A Chinese Philosopher Who flourished above five Hundred Years before the coming of Christ. Being one of the choicest Pieces of Learning remaining of the Nation. Small octavo, bound in full contemporary sheep with gilt titles to the spine, folding engraved frontispiece of Confucius, Consisting of three parts: Of the Antiquity and Philosophy of the Chineses; A Collection out of Confucius’s Works in Three Books; and Eighty Maxims. 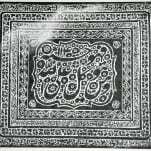 In very good condition, faint stamp to the title page. 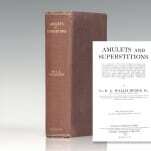 A Commentarie upon S. Paules Epistles to the Corinthians. London: Imprinted by Thomas Dawson for John Harison and George Byshop, 1577. First edition in English of John Calvin’s commentaries on the Pauline Epistles. Octavo, bound in full speckled calf with raised bands to the spine, all edges red, rebacked. 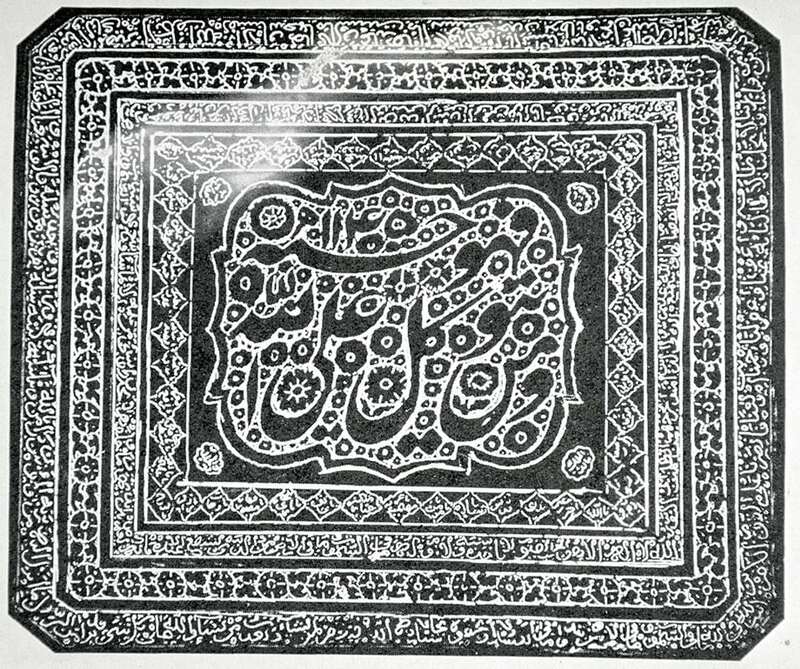 Title within architectual woodcut border, woodcut initials. In very good condition. First editions are rare.